Thanks to Jim Russell for sharing a photo of his grandfather Roy Confer. 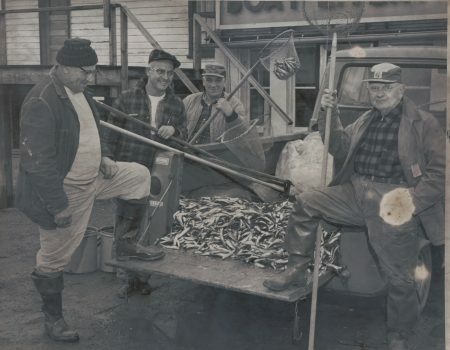 This photo is circa 1950s and shows smelt. Smelt were a small fish and quite a bit of work to clean but were good eating and a popular fish. Back Row L to R Jim Perce and Roy Confer. Front Row L to R Junior Tremfer, Bob Chase, Joe Bednar. Smelt at the Point. 1962 Photo courtesy of Bob Chase, Jr, From left to right: Oscar Fuerst, Bob Chase Sr. , John DeVey and Bill Koush. Frank C Wackerle remembers: Remember it well one time they had the truck so full the front wheels were off the ground !! Robert Concert remembers: Omg! Dad would bring them home by the buckets!! We all would sit at the table with newspapers and scissors…and clean them…very tasty! 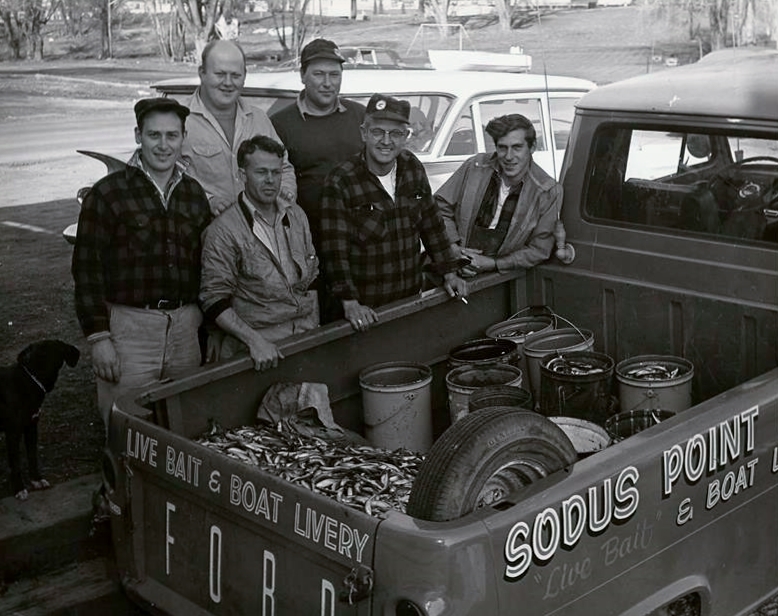 Randy DuBois remembers: Those were the days before the lake was full of trout and salmon. Smelt were delicious. Got most if ours in Mink creek at Hollands Cove. Ted Krebbecks remembers: I remember cleaning buckets of them as a kid. Boots would vibrate as they swam by.